Lapworth Services is a place on the waterways minor waterways place place on the waterways major waterways place village town city on the Stratford Canal (South Section) between Lapworth Junction South (¼ furlongs to the north) and Yarningale Aqueduct (3 miles and 1 furlong and 12 locks to the south). 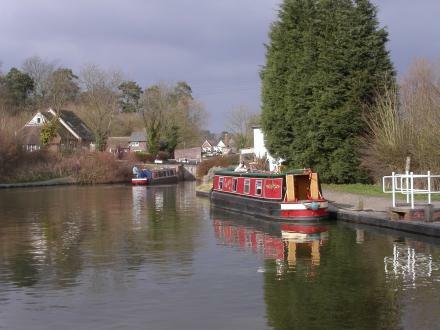 The nearest place in the direction of Yarningale Aqueduct is Lapworth Lock No 22; ¼ furlongs away. Facilities: chemical toilet disposal suitable for DIY pump-out, showers, toilets and water point. Mill Lane, Lapworth, B94 6HR — 1355 yards to the north. Station Lane, Solihull, B94 — 628 yards to the north. Finwood road, Rowington, CV357DH — 1423 yards to the southeast. Lapworth — 399 yards to the northeast. Lapworth Village Hall, Old Warwick Road, Lapworth, B94 6LD — 341 yards to the north. Lapworth — 1140 yards to the west. 14 Brome Hall Lane, Lapworth, Solihull, B945 — 160 yards to the northwest. Brome Hall Lane, Solihull, B94 5RB — 120 yards to the north. Kingswood Farm, Old Warwick Road, Lapworth,, Warwick, B94 6LX — 518 yards to the east. Lapworth, Solihull, B94 6 — 874 yards to the north. Old Warwick Rd, Solihull, B94 6LH — 351 yards to the north. Station Lane, Lapworth, B94 6LT — 500 yards to the northeast. Kingswood — 871 yards to the east. Weston Hall Barn Old Warwick Rd, Warwick, CV35 7BT — 795 yards to the east. Mill Lane, Lapworth, Solihull, B946HR — 888 yards to the north. 5 Finwood road, Rowington, CV35 7DH — 1448 yards to the southeast. Old Warwick Road, Solihull, B94 6LX — 973 yards to the west. Solihull — 313 yards to the southwest. 2 St Chads Cottage, Lapworth, B946LH — 303 yards to the north. Old Warwick Rd, Solihull, B94 6LU — 441 yards to the northeast. The Mill, Brome Hall Lane, Solihull, B94 5RB — 219 yards to the north. 1 Priory Close, Solihull, B94 6JL — 1569 yards to the north. Stourbridge — 52 yards to the northeast. Warwick, CV35 7 — 1444 yards to the southeast. Lapworth, Warwick — 973 yards to the west. 189 Station Lane, Lapworth, B94 6JG — 628 yards to the north. 372 yards to the northeast. Brome Hall Lane, Warwick, B94 5RB — 221 yards to the north. Solihull — 432 yards to the northeast. Station Lane, Solihull, B94 6LS — 674 yards to the northeast. Cedar Lawn, Packwood Lane, Solihull, B94 6AU — 1578 yards to the northwest. Solihull — 208 yards to the north. Foreman’s Cottage, Brome Hall Lane, Lapworth, Solihull, B94 5RB — 114 yards to the northwest. 2, Old Warwick Road, Lapworth, B94 6LU — 432 yards to the northeast. Solihull — 973 yards to the west. Warwick — 1523 yards to the southeast. Old Warwick Road, Lapworth, B94 6LT — 973 yards to the west. Old Warwick Rd, Lapworth, B94 6LD — 338 yards to the northwest. 1421 yards to the southeast.